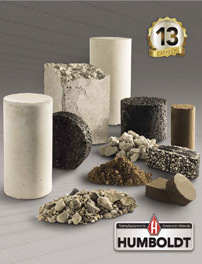 For use by field personnel to check visual classification of soils. Verifies whether excavation side walls require shoring, based on OSHA cohesive soils classifications. Indicates consistency, shear strength, and approximate unconfined shear strength. Direct-reading scale—in tons/sq ft, or kg/sq cm—corresponds to equivalent unconfined compressive strength. Indicator sleeve retains reading after piston is released. Use with 3", 5" and 8" Sieves, complies with ASTM C136.